e-Sword | Byron Howell Ministries, Inc. Recently I heard about a Bible study program for the computer called e-Sword. I quickly checked it out, but I didn't download it or research it further. But I kept considering it and finally I felt like God was leading me to it. I am glad He did, and I thank Him for reminding me. Quite simply, e-Sword is awesome. When I really want to study God's Word I need several websites (Bible Gateway, and language sites) and several books (Bible, Strong's, dictionary). That means I can waste some serious time switching between materials. Now I have all those and more in one program. In one simple window I have everything I need, and I don't even need an internet connection (after initial download). E-Sword is also very customizable. In only a few minutes I built my ultimate personal Bible study program. I have all my favorite translations. I added a dictionary of Bible names and some commentaries. I also grabbed a collection of maps. There are dozens of more materials for free and some for a small fee. The features and functions really take away my need for the websites. With only a few clicks I can search for words, phrases, or other items in every manner I want. Not only that, I can quickly do things that previously took lots of time. 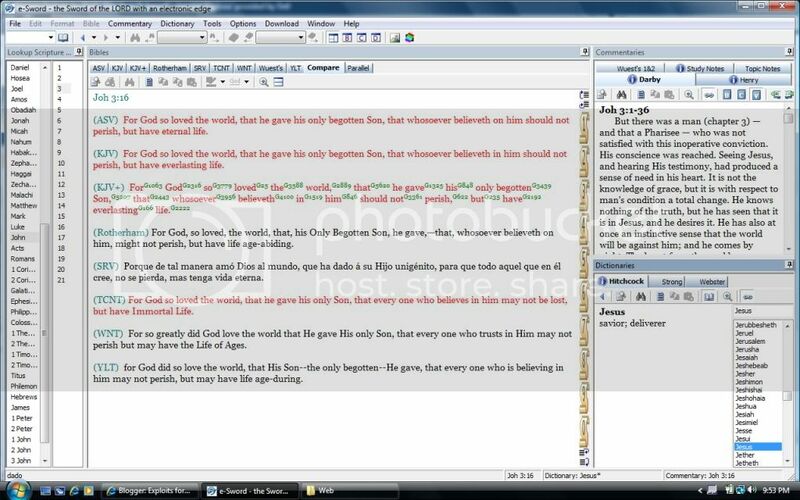 With one click I can instantly compare numerous translations of one verse. With a few more clicks I can create my own parallel Bible. This will revolutionize and drastically enhance my Bible studies. I am so appreciative to Rick Meyers for developing this and giving it freely to all. May God abundantly bless him for this work. Check out the picture of it above so you can get an idea (click then maximize for clearer reading). Then click the link below to download it.